One of the reasons why our homeowners purchase a new SummerHill home is so they can have extra room to host family and friends for visits. While your guests may not be expecting a luxury hotel experience, it’s satisfying to have a room your guests feel welcomed and at home in. 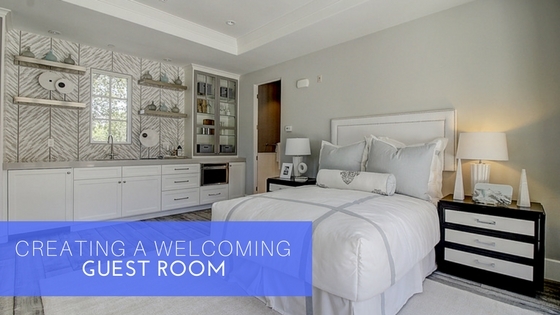 Follow these tips to create a comfortable guest bedroom your overnight guests will love. Get a comfortable bed: Whether the bed in question is a pullout sofa, air mattress, or traditional bed, make sure it’s a comfortable place to sleep! No one wants to lay on a lumpy, saggy mattress all night. Freshen the linens: Whether you borrow bedding from other rooms or keep a dedicated set for the guest bed, make sure the linens are clean and the bed is made upon their arrival. Also include an extra pillow or blanket in case it gets a little chilly overnight that’s easily accessible by your guests (either kept in the room or show them where they can find them). Provide a place to put their stuff: While most guests may not need a full closet or dresser to put their clothes during a visit, be sure to provide some options for storing their things during their visit. An extra chair is a great option for hanging extra clothes or placing a suitcase on. A nightstand is another recommended piece of furniture for the guest bedroom for your guests to keep their personal, must-have items within easy reach. Light up the space: A small bedside lamp will keep your guests from having the stumble around in the dark while looking for a light. Keep the basics on hand: Everyone forgets to pack something. Consider covering the bases by providing travel-sized essentials (e.g. a toothbrush, toothpaste, lotion, soap, etc.) at hand for guests to use as needed. Also keep fresh towels on hand for guests to easily find. Welcome them home: Regardless of the length of their visit, extend gestures of hospitality throughout their stay: provide the WI-FI password, show new guests around the home so they can become acquainted, provide snacks they like. We hope these six simple tips will help you create the perfect room to welcome your guests to your new SummerHill home.